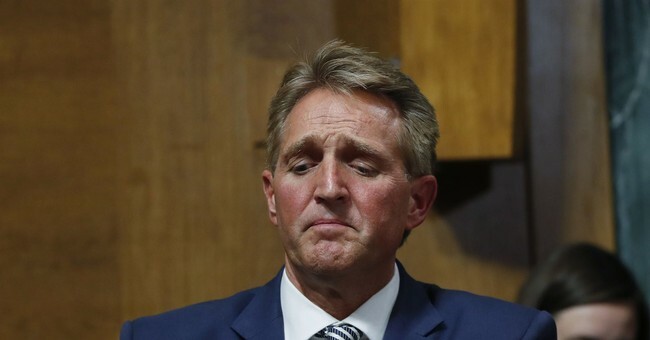 Then, Flake sided with Republicans to advance the nomination of Judge Brett Kavanaugh to the U.S. Supreme Court but requested a weeklong delay in order for the FBI to conduct a supplemental investigation into the string of sexual misconduct allegations that were lobbed against him. All three allegations were dropped at zero hour. All three lack corroborative evidence or witnesses. It has the makings of a political hit job carried out by the Left—and Jeff Flake decided to play Judas in that effort. His siding with Democrats only prolonged this brutal character assassination of an eminently qualified judge and good family man. Democrats will go to extraordinary lengths to destroy their enemies. We need to learn to do the same. Principle isn’t a shield anymore. It’s now something losers say to help them sleep at night when they’ve been outmaneuvered and beaten. Should we be shocked? No. Did it seem staged from the outset? Yeah. Remember how spontaneous Occupy Wall Street was? It’s the same script. I know this has been said a million times, but maybe questioning these women and where they work would be key. No doubt they have the right to push their twisted agenda. No doubt they can confront our elected leaders. They sure picked the right one. But motives of these antics should be looked into. It’s a tall order with the Democrat-media complex, but a fact nonetheless. And this is in no way letting spineless Jeff Flake off the hook. He still screwed us over.